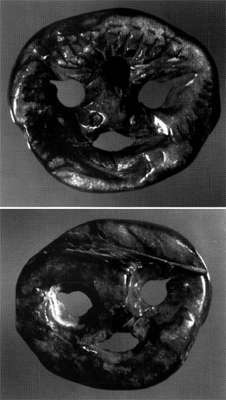 The Mask, or the Face is a perforated oval disk in the form of a flattened face or mask. It is made of partially translucent green-yellow to yellow chlorite. Variations in the colour and translucence of this material make the observation of detail on darker areas very difficult. The specimen measures 19.1 mm from the top of the forehead to the chin, is 23.2 mm wide, and varies between 3 and 5 mm thick, and its weight is 2.80 g. Although it had been thoroughly cleaned, minute traces of fine-grained, yellow, sandy sediment were detected in one nostril, and microscopic traces of red ochre as well as coarse red sediment were preserved in a number of incisions. The front of this piece is highly polished. It is flat in profile, with the exception of a carefully shaped bulge in the centre forming a blunt nose. Perforations create the eyes and a mouth. The eyes are circular, ca. 2.4 mm in diameter, and have small notches in the upper lateral comers. This gives them an animal rather than a human appearance. A series of incised lines radiates from the centre of the face across each cheek. A deep, circular hole is situated in the centre of the forehead. Incised lines radiate from this hole, particularly up the forehead. Although now empty, this hole may originally have contained an inlay of some perishable material. The upper margin of the forehead is demarcated by a dashed line. The nose has a faint bridge and small, widely spaced nostrils. The mouth is set in a wide, deep, slightly upturned incision. Very fine serrations on the lower margin of the mouth may indicate teeth. The reverse side of the face has no facial details and was clearly not designed to be viewed. A series of larger holes was drilled over the perforations in order to thin the stone to facilitate carving of the sharp comers on the eyes and mouth. A deep diagonal incision of unknown function runs along the upper right margin. What this piece represents is uncertain. The radiating incisions on the forehead and sides of the face do not occur in any of the detailed Gravettian human faces from Grimaldi or Brassempouy (Delporte1993) and thus may indicate a face covered with hair. The eyes, nose, and mouth have a vaguely feline appearance, but the lack of ears makes that identification uncertain. It may therefore be either a stylised human or an animal. It should also be noted that this specimen is unlike any other in Gravettian art and must therefore be treated with some caution. To date, we have been unable to prove that it is a fake. It may be more recent than the statuettes and have come from the rich Early Epigravettian deposits excavated by Jullien in the upper levels of the Barma Grande, but without better provenience information we may never know its precise date and associations. This is the only one of the pieces discovered by Louis Alexandre Jullien at the Balzi Rossi that does not fit the theme of the Palaeolithic Venus. Fashioned from a small thin pebble, it is a sparse representation of a grimacing face that seems to convey a curious impression of cruelty, or even diabolism. The eyes and mouth, rendered by perforations, are set off by deep lateral slits that serve to heighten the menacing, cruel aspect of the face - that most likely belongs to an imaginary animal. 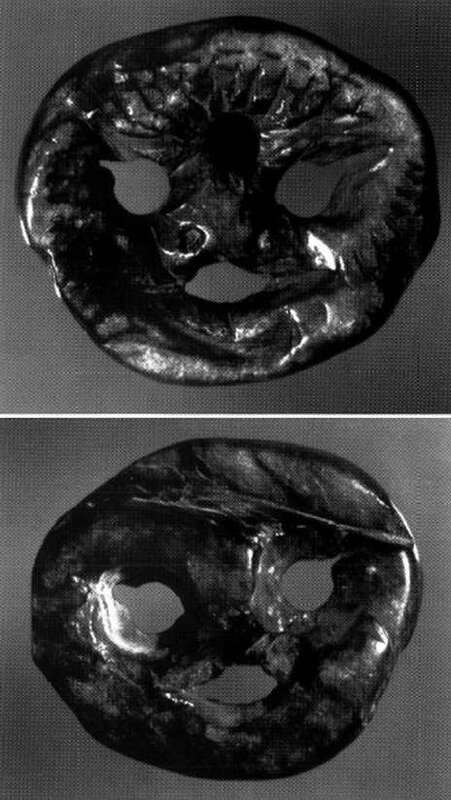 A depression (its purpose unknown) has been hollowed out between the eyes; below this, a small protuberance corresponds to the nose, the nostrils being marked by two little holes. Finally, a complex series of fine incisions on the lips, under the eyes and on the periphery of the principal features completes this extraordinary countenance, which is, at present, unparalleled in the annals of Western Europe's Palaeolithic age. 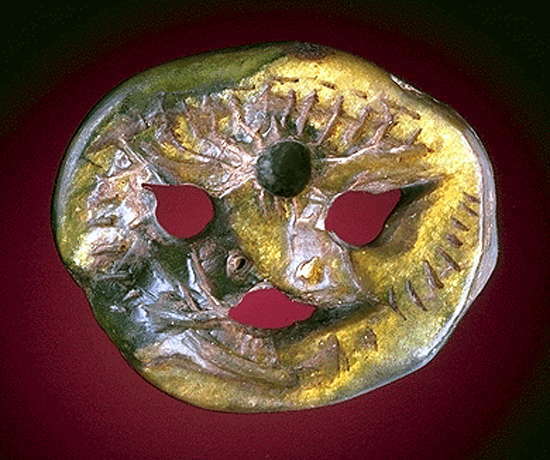 Carved on a lightly mottled (greenish-yellow), translucent chlorite pebble, The Mask is approximately 23 millimetres wide.